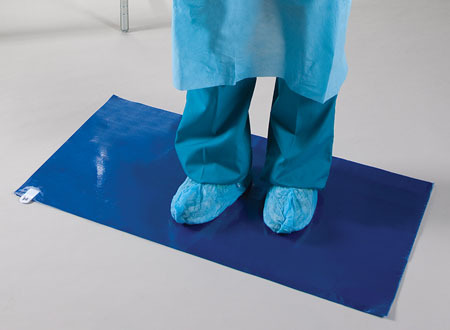 The Tacky Clean Room Mat from Flagship Surgical addresses problems with tracking debris and possible contaminants between areas within your facility. These mats are typically located at the entrance to clean rooms and other biologically controlled areas to remove dirt, dust and other foreign debris. Made from a tacky-surface polyethylene film, which effectively removes foot-borne particulates. The poly film material is impregnated with an anti-microbial agent that provides long-lasting protection against bacterial growth. The mats are of one-piece construction with each mat containing 30 peel-able numbered layers, so refreshing the mat is as simple as peeling the top layer. Each sheet has a numbered tab corner for easy monitoring of changeouts. 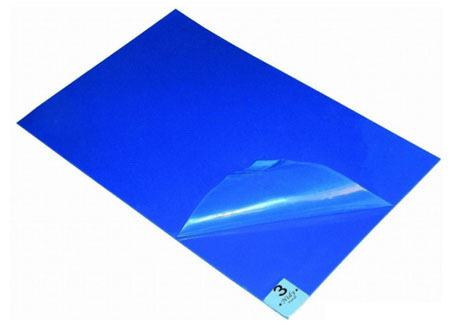 A full-coverage adhesive backing holds the mat pad in place when in use. Easy mobility makes these mats ideal for use near rolling carts and mobile equipment. The entire mat is incinerable for efficient disposal. Product Dimensions: 26" x 45"